OPINION: May I Vent About Cold Classrooms? “Is a window open?” proclaimed Mackenzie Kennedy, a junior and frustrated student at Andover High. She rubbed her hands together for warmth like she was a savage deep in the woods. She pulled up her sleeve and examined the ample forest of goosebumps spreading like an infectious rash. A shiver then erupted down her spine. She was sitting in a science classroom and could barely focus on the work at hand. The school is too cold; not “go put on a hat and gloves” cold, but cold enough for one to question it. As winter approaches in Andover, the arctic tundra seems to cast an eerie shadow over AHS classrooms. The vents, which typically blow out cool air, significantly lower the temperature, making classrooms unbearably cold and bitter. The only aspect missing in the classrooms is snow. One winter fashion statement quickly gaining popularity at AHS as the temperature drops is jackets. No matter how large, how puffy or how ugly, these are essential for survival. According to junior Emma Savely, “I’m always shivering no matter how many layers or scarves I have on.” When you are usually in a building, it is customary to take off your jacket but here at AHS we keep them on all day long. Even math teacher Ms. Adams must teach while wearing a coat. Health teacher Mrs. Breen has been measuring the temperature in her classroom every day. According to her, it is usually around 58-60 degrees. Brrr! That is definitely not an appropriate learning environment. Despite Breen’s frigid classroom, Mr. Cataldo, Senior Custodian, stated that the temperature is set in place by the superintendent and the head of the maintenance department at 68 degrees. Wow! That is almost a ten degree difference. Cataldo admits not every room will be 68 degrees; that’s just what the central temperature is set at. Other factors, such as being near windows, contribute to a cooler temperature. If teachers do not think classrooms are at an appropriate temperature they can report this to maintenance for analysis. Then there are the dreaded vents: the demons of Andover High that make sitting next to one a traumatizing experience. These vents not only blow cool air that terrorize students, but also make your hair blow wild so by the end of the class you look like Mufasa straight from The Lion King. Some popular and emergent classroom decor is books, binders or whatever one can find to cover these vents. According to junior Griffin Clark, “In my chemistry class we’ve tried different things to get the cold air not to blow because so many people complain about it.” One rumor making its way through AHS is that blocking the vents produces carbon monoxide- a chemical that can cause death due to oxygen starvation. To ease worries, this speculation was refuted by chemistry teacher and science enthusiast Mr. Jannetti, who claimed this rumor was not true and students should not worry. Well that’s some good news! There is a logical reason for these vents, though. According to Cataldo, the switching of the vents from hot to cold air is based off of the carbon dioxide levels in the classroom. The vents exchange the air so that it brings in fresh, unheated air into the rooms- that’s why it seems cold. Finally, an explanation that makes sense! While it’s inconvenient to sit in a class and be harassed by a vent, they are essential for proper ventilation. Some students don’t mind the cold temperatures. 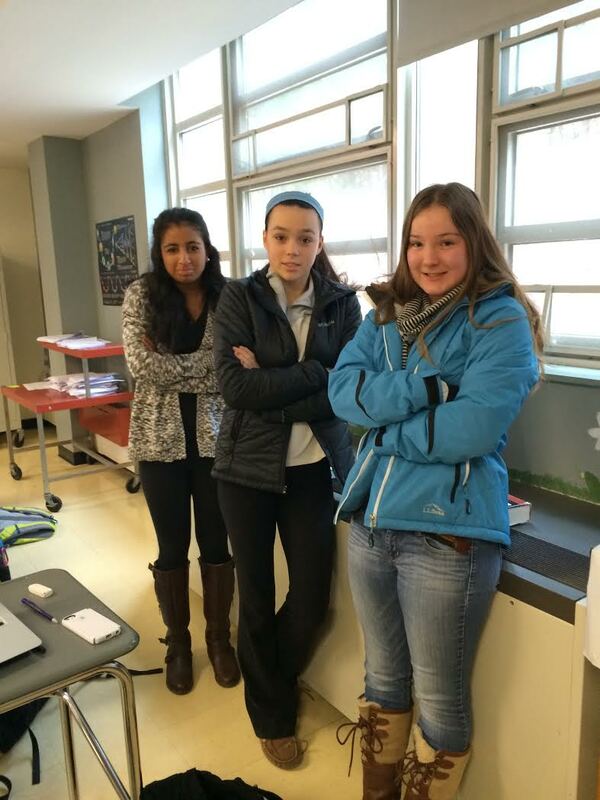 Senior Meaghan Murtagh said, “I don’t think [the lack of heat bothers me] too much. It’s uncomfortable but you get used to it.” Sophomore Dimitry Jean’Laurent agrees, and thinks the temperature in classrooms is fine. This cold spell doesn’t bother everyone apparently, but it is not uncommon to hear students complaining about the chilly temperatures. Even though temperature can be a significant distraction in class, it is unlikely one will start failing classes because they are cold. The cold air will still be blowing and the temperature will probably never feel like 68 degrees at AHS, but summer’s only five months away… and then complaints about the scorching heat will begin. For now, you can focus on the cold though. Remember to bring an extra warm jacket to school; it’s going to be a long and miserable winter at AHS.